We're now less than a week away from the book launch... even sooner than I had thought! They'll actually be going on sale next Tuesday, according to Topatoco commander Jeff. And on that same day, Topatoco will also start selling our Skull Panda in Love books, so if you've been waiting to pick one up, now you'll have your chance! And that's not all! Jeff's new Overcompensating book, A Dangerous Obsession, will be launching at the same time. That's why we're holding a big book launch party in San Diego. Just head over here for all the details! Until then, here's a sneak-peek photo Jeff sent me to tide you over! 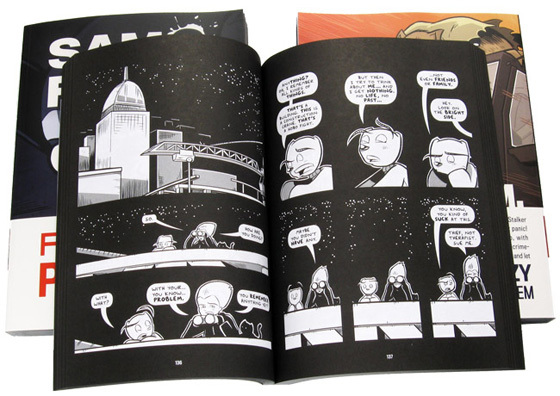 Man, after you've seen how much nicer Sam and Fuzzy's high contrast black and white art looks on big, full-bleed book pages, you'll never want to read it on your computer again. I am completely serious. You will literally throw your monitor in the garbage. 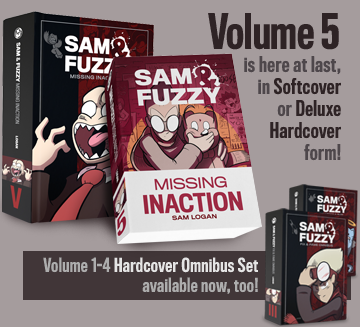 It's official: our new book, the Topatoco-published 368-page opus Sam and Fuzzy Fix Your Problem, will go on sale on July 20th. That's next Tuesday, friend... only 9 days from now! Where will you be able to buy it? 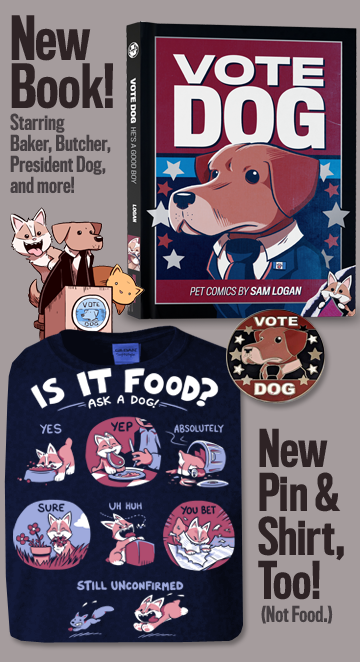 And of course, I'll also be peddling and signing copies at Topatoco's San Diego Book Release Party! If you're in town for the convention, or for any other reason, come to the at the Quality Social to hang out with a bunch of webcomics people and eat hilariously tiny food. Thursday, July 22nd, from 8PM til THE FUTURE! But don't worry... even if you can't make it to San Diego, you'll still be able to get a signed/sketched version of the book. How is this possible, when Topatoco HQ is a good 1000+ miles away from where I live? Occult magic! And also I mailed them a batch of of signed and illustrated bookplates. You can see a small sample of the some of the bookplates I drew below! Every "artist edition" of Fix Your Problem will have one of these on its inside cover. (And if you really, really want a specific drawing or personalized message, you can buy a bookplate straight from me and attach it yourself.) Take that, geography! Sure! In Canada, we just pick your favourite four-letter swear word and add a silent "u". I've never thought of those cartoon swear word symbols as literal stand-ins for specific letters. Like, a '#' does not equal an 'f' or something. There is no decoder ring you can buy to reveal the naughty stuff. Although that's a missed marketing opportunity if I've ever heard of one! Personally, when I am hearing the dialogue out loud in my head, I imagine cartoon swears as an unintelligible string of growling consonant sounds. FJKSRDN! Or maybe we just had an all-day BBQ and watched the fireworks. Believe what you want! That's a wrap for this week, friends. See you on Monday!